LOVE's Haven: Amazing Grace Amazing Birthday Contest Yr. 3! 1. 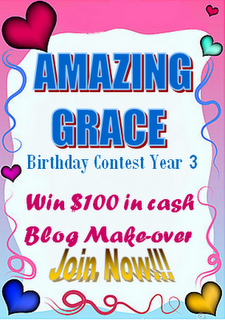 Blog about the contest with the badge and the title "Amazing Grace Amazing Birthday Contest Yr. 3! " Subscribed to my other blogs and include them in your bloglist : A Walk to Remember, Gracia Fashionista, Amazing Grace , kids turf , Here , there and Everywhere, A Bucket of Wisdom, I love CDO, Heart and Matter and Healthy at 40. 2. Return to this post leave the URL of your contest post.